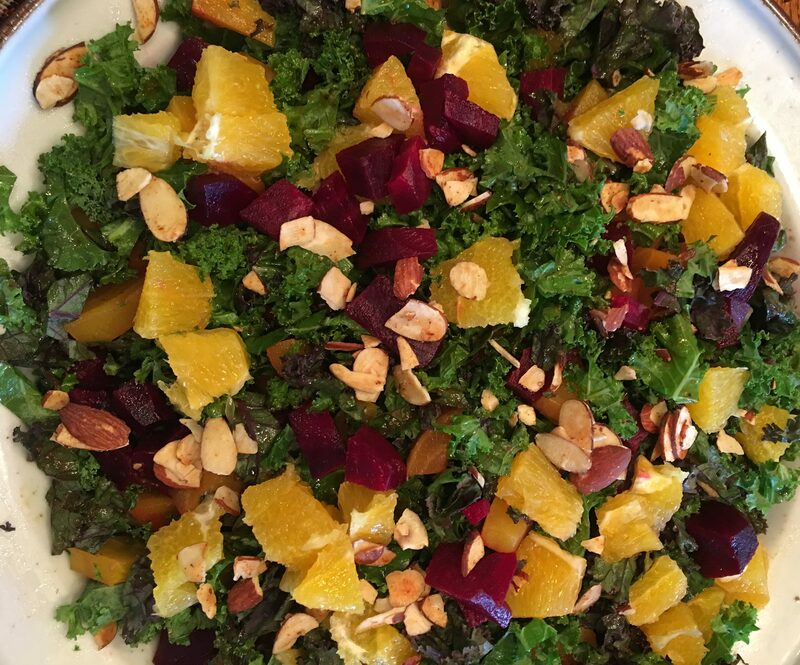 Kale Pesto Citrus Salad made with kale, pesto, and a navel orange is not your typical kale salad, but the combination of these three alpha ingredients makes for a truly delicious salad that is also nutritious and colorful. The other ingredients – beets and sliced almonds – are not as bold but add significant flavor and texture to a perfect Autumn salad. The key to this salad is a light pesto dressing. I use Seggiano Kale Pesto* which captures the dark leafy green flavors of black kale (or “cavolo nero”), a hearty winter vegetable but a traditional pesto sauce is also delicious. My recipe calls for 2-3 tablespoons diluted with a 1/4 cup of water to make the dressing light. Don’t underestimate the importance of the navel orange pieces. 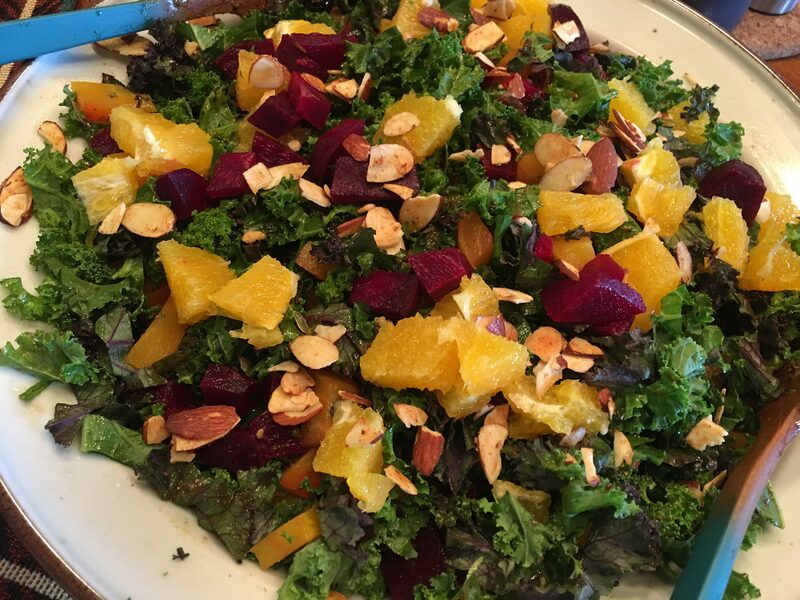 The flavors of kale and orange work really well together. 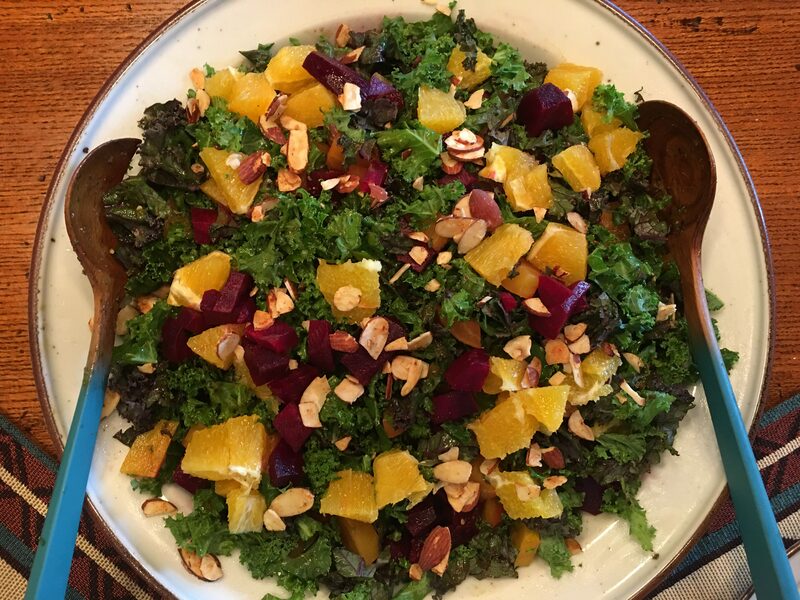 Easy to make with just 6 ingredients, the Kale Pesto Citrus Salad simply requires time to roast the beets (to avoid this, buy precooked beets at the grocery store) and to cut the kale leaves from the stems (this is easily done with a pair of scissors. Wash the leaves and turn a single leaf over to cut the leaves from the stem, and repeat). Then, it’s just a matter of chopping the kale leaves and combining the ingredients. I often prepare the kale ahead of time and place the chopped leaves in a large salad bowl in the refrigerator until ready to serve. Cut the leaves and ends off the beets and place on a piece of parchment paper lined roasting pan. Cover and bake at 425 degrees for about 45 minutes (baking time varies based on the size of the beets) or until tender (stick a fork in to test for doneness). Remove the beets from the oven and rinse with cold water. Allow to slightly cool and peel or cut the outside skin of the beets off. Cut the beets into bite sized pieces and set aside. Rinse the kale leaves and dry off. Turn the leaves upside down and using a pair of scissors cut the leaves from the major stem down the middle. Discard the stems. Using the scissors or a large knife, cut the leaves into small pieces and then place in a large salad bowl. Cover and chill in the refrigerator until ready to serve. Cut the ends of the navel orange off. Using a pairing knife, cut the peel off the orange. Then, cut the orange into quarters and then into small bite size pieces. Set aside. Place the pesto (less for a lighter dressing, more for a heavier flavored dressing) into a small mixing bowl. Add the water and whisk to blend. Set aside. Remove the salad bowl from the refrigerator and drizzle the pesto dressing over the kale. Toss well. 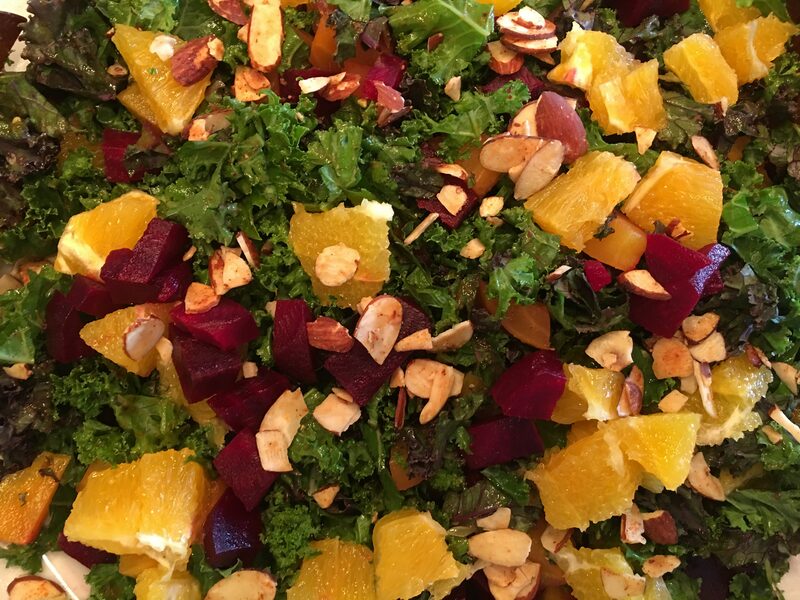 Sprinkle the beets and orange pieces over the salad. Toss. Sprinkle the almonds over the salad and serve. 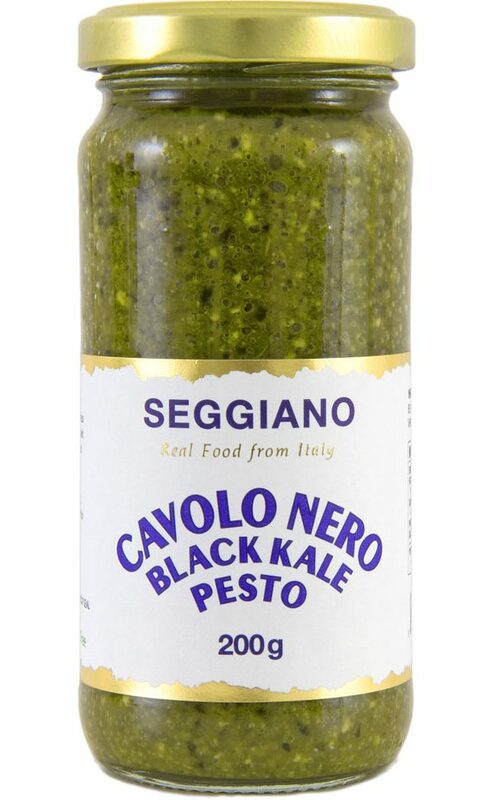 *Seggiano Kale Pesto is made with extra virgin olive oil, kale, cashews, sea salt, vinegar and citric acid, and is available at most Whole Foods Stores or on-line at www.organikthings.com. A 7.1 ounce jar is about $10 – expensive (because of the excellent ingredients) but worth it because a small amount goes a long way. In addition, the pesto can be used to make a light pasta sauce by adding low sodium vegetable broth. This pesto is a pantry staple and great to have on hand when you have to put together a delicious meal quickly.